A simple slide potentiometer can go a long way. Rated at 10kOhm and 0.5W. Comes with solder tab connections. 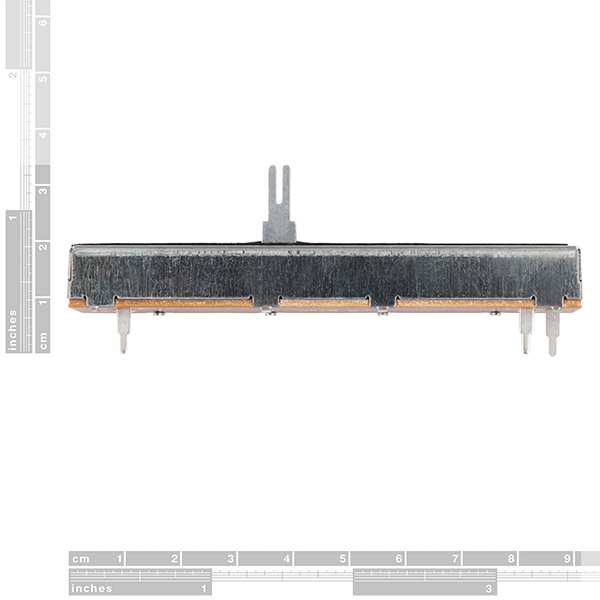 The taper profile for this slide can be found in the datasheet below labeled "0B"
Does anyone have suggestions on how to solder to the tabs on these? The tabs are too big to go through standard perf-board holes, and there's no obvious way to mechanically attach a wire (e.g. no hooks, holes, etc.) to strengthen a direct wire connection. Is there some kind of female terminal that's intended to mate with these? Maybe a bit late to reply, but a simple solder and heatshrink job would be more than enough, just wouldn't want to have those wires 'flapping in the breeze' and pulling on the tabs, so possibly fasten them to other wires or to the case when the project is done. 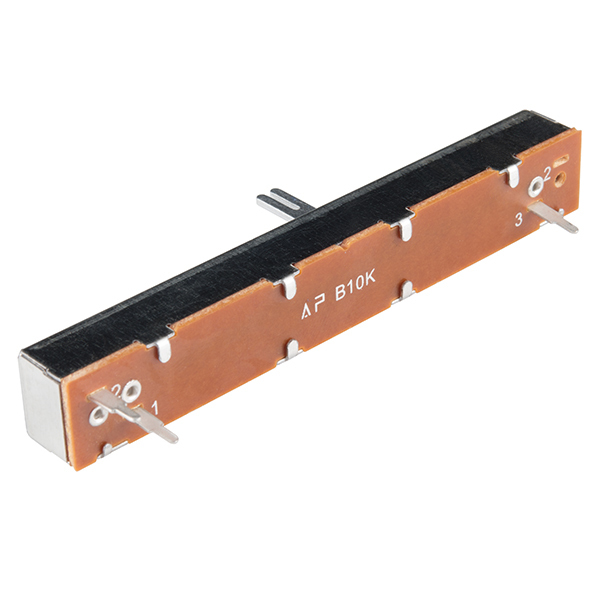 These are designed for printed circuit boards which can have different size holes for different parts. Might be difficult to solder because as you mentioned there's nothing to hold a wire while you solder it, so an effective strategy is pre-tinning the wire and tab, and then you can just heat the two together if you don't linger the iron on too long for the solder to oxidize. 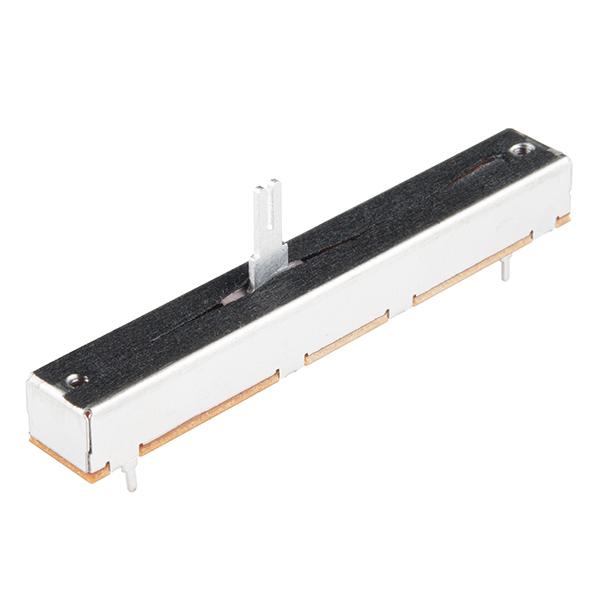 Is there such thing as a potentiometer which works like this, but instead of sliding fluidly, has a certain amount of stops, or stages? Kind of like a slide switch, but with more positions, and also as a potentiometer. Wayyy late to this comment, but for future readers, sure is! Not sure if anywhere like sparkfun sells them, but I found some on digikey under the slide switches. It'd be a single or double pole, multiple throw switch. What size are those mounting holes? Datasheet states M3X0.5 - doesn't state travel depth though. AKAI APC USERS This is not the correct part if you're attempting to replace the APC 40 (or APC 20) faders. You'll need smaller ones... still attempting to locate these. 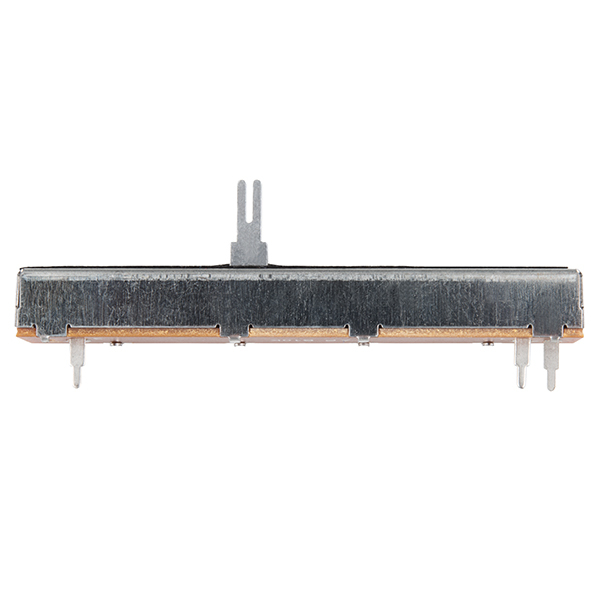 Anyone know how easy/hard it would be to mount this as a replacement on an APC40? I tore it down and have access, just don't know if it will require soddering, etc. Anyone with experience want to do the repair if I supply the parts and even strip down the APC? why is this under Buttons/switches...? its neither a button or a switch, just wondering. Mine does the same thing. I don't think they are supposed to . I'm looking to use 8 of these for a wireless dmx controller. my question is are the sturdy enough to handle a lot of use as i will be using this when ever i am hanging lights from a genie lift. How stiff are these? I'm looking at making a MIDI controller and would want something more on the loose side. They're perfect for a MIDI controller - I'm building one right now with 4 of them. The ones I received were logarithmic taper though, currently emailing customer support about replacements. i just ordered two and they were log taper as well. Email techsupport@sparkfun.com. They'll be able to assist you with getting replacements. Sorry about that! they aren't very stiff. the slide pretty freely, IMO. How clean is the analog signal out of theses? when you move the slider and stop does the resistance settles? Does anyone know the size of the screws that these pots take to panel mount them? Looking at the datasheet, I noticed that the slide is about .05in thick, so I'd say the screw holes are approx. .05-.1in thick. I got one of these in my last order but it only has 3 feet (or I guess they are lug connections). I'm new and all but I assume I can just take the backing off and make my own connection? It would be best to email customersupport@sparkfun.com and get a new one. Yeah I guess. Trying to fix it helps me learn though. For a mixing console, you'd probably want audio taper. I believe these are linear taper?